Are you looking for STEM related courses for your home educated child? 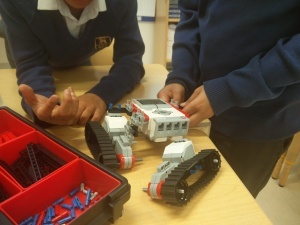 We offer workshops based on LEGO® MINDSTORMS® sets. This is a great opportunity to join together learning with fun. We teach children how to design and build robots, moreover we teach them how to program their constructions to execute different tasks. We do not follow any step-by-step instructions to stimulate children’s creativity. We let them to design their own constructions with our support. Children learn how to build robots from scratch starting with the most simple ones and turning into more complex ones. We add new parts, teach how to use sensors, motors, gears and many other elements. Our original program has links to national curriculum. Children can develop their manual skills, spatial imagination and creativity. During our classes each robot is original and individual. Once your child will understand basic rules of construction we will start to teach them programming. We work on user-friendly software intelligible for even 8 years old children! Kids explore amazing world of programming, learning through fun. We do not force them to memorize formulas and to learn commands by heart. We teach them to think like a programmer, how to make use of functions and algorithms. The offer is dedicated for home educated groups. The minimum group size is 6 children. Workshops are organised in 10 sessions cycles where each session lasts for 2 hours. The price is £165 per child (if group size is bigger than 13 then price drop to £79.5). Price do not include room hire as it can be organized even at your house.